This is the second part of my introduction-series to scientific python. This time, we gonna continue with plotting our data and than we gonna move on to some general coding and coding techniques. If you haven’t read the first part, you can check it out here. It was fine for a first try, but far from a publication-ready figure. We gonna fix that now. I will show you two ways to do it. That was easy… And we got a proper looking lambda. Pro tip: You can use Latex syntax throughout your matplotlib plots to create awesome looking equations and special characters. Next, we need to fix the axis limits. It is kind of ugly that the graph starts in the middle of our figure and touches the top border. To make our code reusable we gonna define the new axis-limits relative to our data. Last, we add a grid to the plot. Generally, you don’t have to do it, but I like the look of it. Well, that a good looking plot, don’t you say? Good Question! 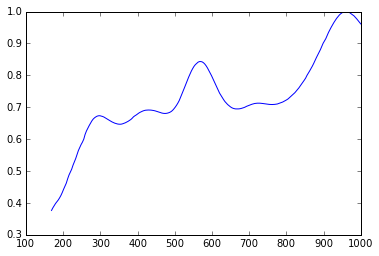 Let me explain: The matplotlib functions we used until now where very high-level. No, this doesn’t mean we had to be very skilled to use them, but rather the opposite. Functions like plt.plot do a lot under the hood and modify and create many different components of our plot all at once. This is nice for quick interactive plotting, but comes with the trade-off of sacrificing flexibility and options. Therefore, if you want to create a complex publication-ready plot, I strongly suggest the following way. Inside the parentheses you can specify the name and, very interesting regarding publication guidelines, the size (in inches) and the dpi of the figure. Keep in mind, all these parameters are optional. If you don’t need them, just omit them. I highly recommend running the script after each line of code we add, so that you can better understand the different parts of our plot. If you read my little site-note and ran the script, you probably noticed that nothing really happened. This is, because we haven’t told matplotlib to do anything. We only initialised a figure object and assigned it to a variable (fig). To actual make the plot visible we have to call show() on our figure object at the end of our script. You executed the script again? Still no plot? Yeah, but this time its not the fault of our programming, but rather our choice of tools. The ipython inline-backend (check the the first part of the series to learn more about it) doesn’t support the show command. Therefore, we gonna switch to the qt backend by typing %matplotlib qt into our console (not the script!). Keep in mind, if you restart the shell, you have do this again. If we rerun our script now, we should end up with a beautiful grey canvas in an external window. Again, check your taskbar; the figure window was probably opened in the background. Keep in mind, fig.show() must be called at the end of the script. Hence, AFTER all the following code. Let’s put something on this grey wall, shall we? What’s usually living inside a matplotlib figure object, is a matplotlib axes object. You can add a new axes-object by using the add_subplot command. This will divide the figure in a subplot-grid with 2 rows and 3 columns and will put the axes on position 4 (outer left position of the second row). Nonetheless, we gonna continue with the 111-subplot. Now we have to add our data to the plot. As in the last part of this series, we gonna use the plot command. However, instead of plt.plot, we use ax.plot to target our created axes directly. This is one of the biggest advantages of creating plots in this object-oriented way. By creating and assigning the figure and all axes to individual variables, we can specifically target them using the variable names. The general plt.plot-function always targets the currently active axes object (or creates one); this can be very confusing when creating complex plots. By the way, the line we created by this command is a Line2D-matplotlib object. 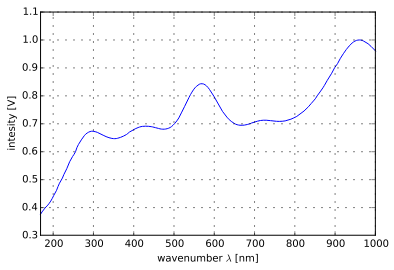 Hence, if you want, you could also target a plotted line individually and alter its properties. But this is usually nothing you should need to do. Ok, now our plot is back to the started with today; but this time we have chosen a more object-oriented and expandable approach. Let’s do what we actual wanted to do: making the plot pretty! This part is basically identical to the “easy” way. However, we target the axes directly again. Note, that there is a slide change in the syntax (xlabel –> set_xlabel). And we prettyied-up the plot again. Before we leave matplotlib alone for a while, I want to point out on more thing: If you need plots with precise sizes and aspect ratios (and you probably will), I highly suggest enabling tight-layout for your plots. This shrinks the subplot, so that non of the labels exceed the figure (learn more here). You need to put the command at the end of your script right before the show-command. Even though there are endless formats available, always use a vector format (pdf, eps) unless you have a real good reason not to. If you are somewhat familiar with any kind of programming language, you may have noticed that we haven’t touch any of the fundamental programming concepts yet - the things that allow to create modular, efficient, non-redundant, and reusable code, and make a scripting language that much superior compared to graphical tools. Looking back on our code, every line can somewhat be translated in a press of a button in Excel or Origin. That’s because everything was written and executed top down. The power of scripting, however, lies in the possibility to automate multiple steps. The “automation-tools” I want to talk about today are loops, functions, and if-else-statements. As the name probably already gave away, loops are used to do something over and over again. In programming there are for-loops and while-loops. However, latter are less interesting for scientific programming. For every value in my_list, print the value. i is equal to 0. While i is smaller than 10, print the value of i and add 1 to i. Keep in mind, you need to import numpy as np again and ran the code in our ipython console or from a script. Check out the first part if you have problems with that. This method is not only shorter to write and clearer to understand, but also 15x faster than the first one (1.52 ms vs. 0.102 ms). Nonetheless, if you evaluated that you are in need of a for-loop, here are some examples and handy tricks. The zip command takes two (or more) lists of equal length and returns a new list which holds the old lists combined element-wise. Check it out by trying print(list(zip(test_array_1, test_array_2))). When you want to iterate over the rows of your array instead of the lines, you can simply transpose the array before iterating. Don’t forget, the last two examples only work with numpy.arrays and not with simple lists! Let’s take a quick look at while-loops. As said, they are not that important in scientific computing. Nonetheless, you gonna use them now and then. In contrast to a for-loop, a while-loop doesn’t run until the end of a list is reached, but rather until a certain statement is not True anymore. To write a while-loop you need the keyword while followed by this statement. The statement always consists of a variable, a comparator-operator, and a comparison value. The only exception is the while True: loop, which simply runs forever. The most common usecase in scientific computing are probably approximation-algorithms. For example, the numerical calculation of function roots using the Newton iteration. I won’t explain the details of the algorithm or this specific code snippet here, but as you can see, it uses a while loop to check if the algorithm has already converged. The statement checks if the difference between the calculated value of the root and the one calculated in the previous iteration is bigger than a specified threshold h. If this is not True anymore, the loop breaks and it is assumed that the algorithm has converged. The last calculated x-value is than one root of the given function f(x). If-else statements are exactly what it sounds like they are; they are used to execute some lines of code only if a certain condition is met. Let’s say you want to check if some value is bigger than a certain threshold and sort it based on this. So, similar to the while-loop, a if-statement consists of a keyword (if), the condition, and a colon. The code which is executed when the condition is true is of course indented. Note, that my example above is a completely valid if-else-statement, even tough it has no “else” in it. If you omit the else, Python assumes you just want to do nothing and proceed with the rest of the script, if the statement is not met. Some people want to be more explicit about it and therefore use an empty else statement (“pass” in Python means: “Do nothing, just go on”). Before we get into more complex if-else-constructions, we gonna explore the different conditional operator you can use. First you have the mathematical operators (<, >, =). They basically work as expected and can be combined to “is smaller or equal” and “bigger or equal”(<=, >=). However, the order matters; “=<” and “=>” are invalid syntax. If you want to test for equality, you have to use the double-equal-sign (==) and for non-equal a explanation mark with a equal sign (!=). These mathematical operators are nor limited to integer or float values, but also work with strings, lists, or boolean values (True or False). However, only objects of the same type can be compared. The “magnitude” of a string is determined by its position in the alphabet (“a”<”aa”<”b”<”ba”<”c”), while strings containing numbers are positioned before alphabetic values (“1”<”1a”<”2”<”a”). Regarding booleans, True is by convention bigger than False. Just play around with these examples a little bit to get familiar with the mechanics. As substitution for the double-equal you can just use the English “is”. This is actually the preferred way when comparing boolean values. In combination with any of these comparison operators, you can use the “not” at the beginning to reverse the statement. Another handy thing is to check if something is member of another object. This can be done with the “in” operator. The last important thing to know is, how to check if an object is empty, but exists. If you assign a new variable using empty quotes or empty square-brackets (empty_string=”” or empty_list=), an empty object is created. You can check for this inside a if statement by calling the variable name. You can chain multiple conditional statements together using “and” or “or”. The output is of course “a is 2”. But what happens in the following situation? Both, the first and the second statement are true. However, only the first case gets executed. Therefore, to avoid complications, only use elif, if just one of the statements can be satisfied at a time. To do something like above, you would just use multiple if-statements. So I think that’s pretty much everything to know about if-else-statements. I gonna spare you with more complex examples as you will see if-statements throughout the next parts of this Python tutorial (how ever many they may be). To create a function you have to use the keyword def followed by the function name and the input parameters (border-control-rules) enclosed in parentheses. Finally, you end the line with a colon. I think, it is obvious what this function does. But how to use it and what did I meant by “separated scope”? To use a function you simply have to call it by name and pass input-parameters enclosed in parentheses. So, “new_x” doesn’t exist outside of the function. The other way around, however, you can access (but not modify) variables defined outside the scope without explicitly passing them. I am only showing this very briefly, because I want you to immediately forget that this option even exists. Using global variables inside a scope is a very bad habit. If you need certain variables inside of your function, pass them as arguments. Now that we understood the concept of passing variables from our script to a function, its time to learn how to retrieve variables from a function. Using the return statement, it is possible to capture the output of a function. On the script-side this output can be assigned to a variable. Before we move on to some advanced examples (unfortunately not in this part of the tutorial), I want to show you the real power of parameter-passing in Python. Fist, passing parameters by name instead of position. Now we can just omit the parameter when calling the function and if we don’t want to print out the value. So these are the essentials to getting started on the pure Python side of things. Of course, we barley scratched the surface, but I think it is enough for now. I want to finish up this part of the tutorial with a few words about object oriented programming. Yeah… No real practical example this time around because the post is already pretty long. But, we gonna use this opportunity and kick of the next lesson with a nice, more complex example to refresh our knowledge about everything we learned so far. And finally to fully get into Python’s “black magic”, create and return a function from a function. This is called a “closure”. Don’t worry if you don’t get it… Its not something you gonna need very often. The other important thing that derives from Python’s object orientation, is that many basic things you do, are actual function calls on an object. For example, if you are trying to get an element from a list (list[n]), no Voodoo happens, but rather the __getitem__()-function of the list object is called. With this knowledge, you can mess around and change the fundamental behaviour of python, or enable cool things, like element calling, for custom created objects. But this is again a lesson for another day. For now, just keep in mind, everything is an object and can be passed around without loosing its properties and behaviours. PS: Maybe you read through this tutorial and thought, why the hell should I need a function which can add 1 to a value, or why do I possible want to check if 12 is greater than 10? Simple answer - You don’t! These short example are meant to visualise the syntax and the basic possibilities. In a complex example it is much harder to showcase only a single basic part of Python’s capabilities. However, if you understood this basic examples, I am sure you can think of more complex and useful ones. With that said, keep on coding and learning! This is everything for today. I am sure you learned something and further I hope that I woken your interest to learn more about Python. As always, leave a comment or contact me in any other way if you have questions, critic, suggestions, or anything else.